Trial and Erika: Me Made May Week 2 Roundup! I honestly can't believe week two is already over, and I'm kind of starting to freak out because I'm almost out of things to wear and I want to keep the repeats to a minimum if possible. Oh, and I need to make a men's button down shirt by Saturday, and I have commitments on Tuesday and Thursday night. I should procrastinate less. 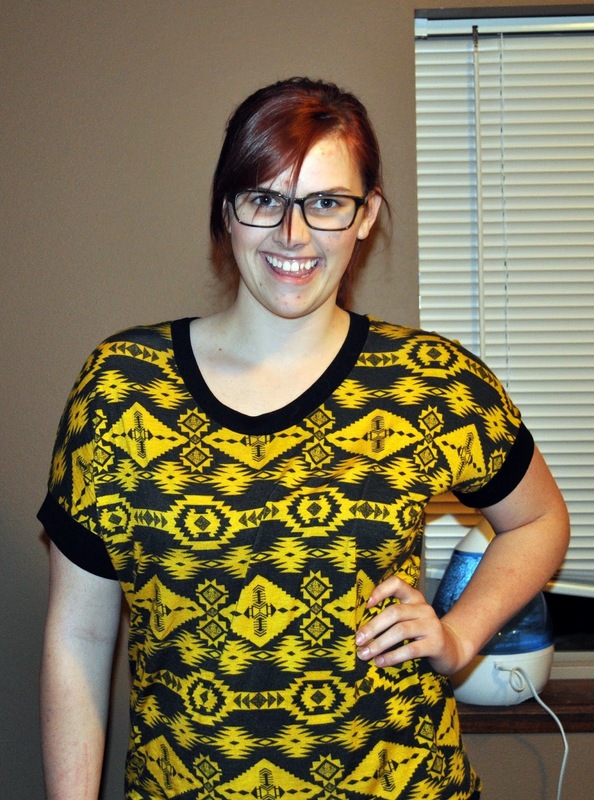 Day 5: Tribal-ish Day Tripper top. My love for this pattern has no bounds. 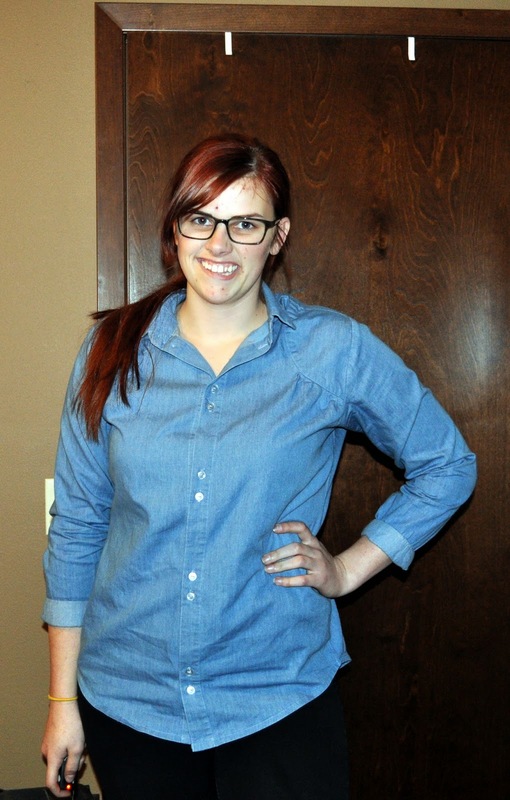 Day 6: Chambray Meissa blouse from Papercut Patterns. I can't get enough of this shirt. Although I do need to make the sleeves a little wider next time. 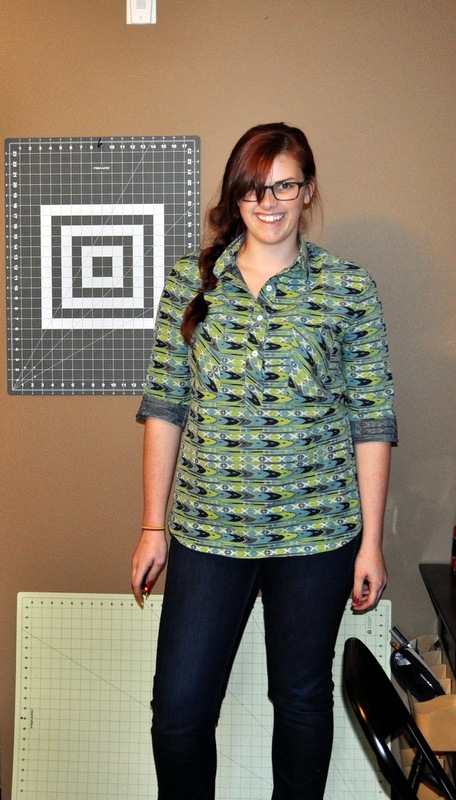 Day 7: Another popover Archer, in a fun ikat chambray print from Joann. Don't even ask me how stupidly overpriced this fabric was (OMG IT WAS SO EXPENSIVE). Day 8: Feeling frumpy in my original Day Tripper. About two seconds before this picture Clyde jumped up on me and made that lovely stain on the bottom of the shirt. I think he hates this shirt for some reason? But I love it to bits. Day 9: Grainline kind of day. The Moss mini that I made for Moss Making Month and never had time to blog, and my super fun colorful Archer that I love even though I could make it SO MUCH BETTER now. This was also my first time ever wearing a mini skirt. And I wore it in public for like 7 hours selling crocheted things at a craft show! Woo for branching out during Me Made May! 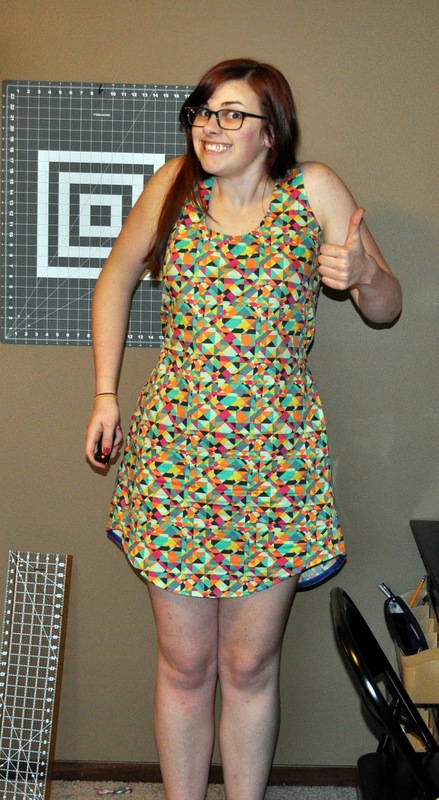 Day 10: My newly made Tank Dress by Sew Caroline! I really really really love this fabric, and the pattern is great too! Next time I'll probably need to drop the armpits a teeny bit, but really that's all I would need to change. The shirring on the back is awesome, and would be awesomer if I could sew a straight line and if I had shirred it where my waist actually is. Live and learn. I still love the crap out of this dress. Day 11: Another Day Tripper, no way?! Just lounging around the house in suuuuper dirty pants, really need to shower, haven't brushed my hair (even though I worked for 5 hours this morning?) and this shirt is perfect for it. Ok real talk I need some advice. 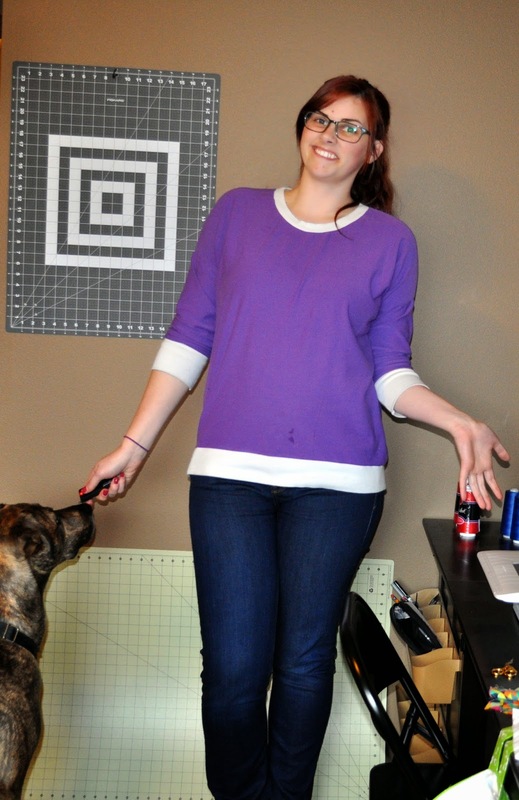 For those of you who have the joy of thighs that rub together what do you do when you're wearing dresses/skirts to avoid chub rub and/or chafing? Because this ain't pretty, and it doesn't feel good. Curse you, thunder thighs! Great week of outfits- I really love your Day 10 dress- so pretty for the summer! My best advice for wearing skirts/dresses is to wear either nylons or tights under them, which is what I usually do- and if you don't want the look of tights/nylons and your skirt isn't too short you can wear mid-thigh biker shorts underneath- which is also great if you have a fear of flashing people too! 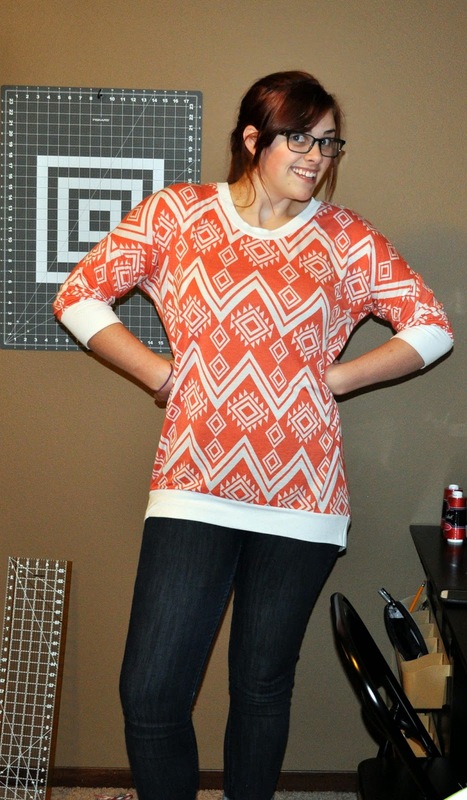 I love wearing tights, I'm all about adding more color to an outfit! But I don't know how I feel about it during the summer, I feel like it'd just be a sweat trap. Although I've never done it, though. I was thinking about getting some body glide. A lot of runners use it to prevent chafing during longer runs. I forsee an all-too-personal post about chafing in the future! Ha. I am loving the colourfulness of your me made May. I'm definitely learning that I don't really own anything me-made that is neutral. I think I'm ok with this.